This book provides a complete primer on the subject of evidence based practice in healthcare. This book provides a complete primer on the subject of evidence based practice in healthcare. As an introductory single textbook, it is especially useful for nurses undertaking academic study, or new to the subject. The authors have made the content relevant to practice. A new chapter focuses on practice development and will be of particular use to ward and service leaders. The book is divided into three parts: introducing the topic of evidence based practice, critiquing evidence and using evidence to make changes in practice. There are 12 chapters covering topics such as types of evidence, searching for evidence, systematic reviews, critical appraisal and professional and practice development. Both qualitative and quantitative evidence is explained and individual chapters stand alone as introductions to topics. Different authors contribute to the chapters but the editors have brought a consistent readable voice to the text. The layout makes it easy for the reader to navigate. Illustrations enhances the text, learning outcomes link to summaries and there are quizzes, further reading and e-resources. 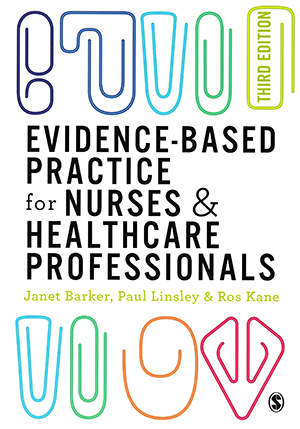 Critical appreciation of the evidence base is a requirement for professional practice and this book is a well-written and useful guide to the subject. Several books are available covering evidence-based practice and this is one of the best single texts.